Providing Support for the 15th Annual Tax Planning Strategies U.S. & Europe — Ruchelman P.L.L.C. For the second year running, Ruchelman P.L.L.C. will sponsor the A.B.A./I.F.A. 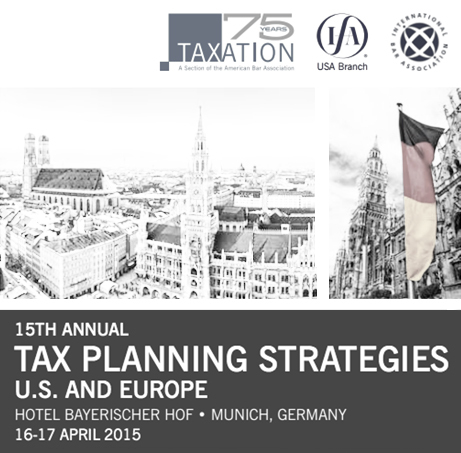 Tax Planning Strategies U.S. and Europe Conference in Munich, Germany on April 15-17, 2015. Now in its 15th year, the annual conference focuses on recent legislative developments impacting global companies with panel discussions featuring industry leaders, senior government officials, and leading tax practitioners from the United States and Europe. Key topics will include the E.U. Commission investigations into illegal State Aid, new Treasury rules aimed at deterring corporate inversions of U.S. corporations, and the future of exchange of information in light of new G-20 and O.E.C.D. agreements, the B.E.P.S. Action Plan, and F.A.T.C.A. Click here to view the brochure and here to register.